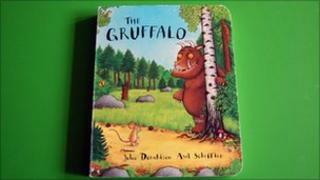 The Gruffalo has come out top in a survey of children's favourite books. Almost one in five children (18%) picked the Julia Donaldson tale, while Eric Carle's The Very Hungry Caterpillar and Peppa Pig, by Ladybird books, came joint second with 11%. Children aged between four and 11 of more than 1,500 parents were surveyed for free reading scheme Booktime. The survey also suggested parents encouraged children to read the books that they had enjoyed. There were strong correlations between parents' favourites and the ones their children liked. The study for Booktrust's gifting scheme Booktime 2010, which will give more than 1.3m books to school reception children in England this month, suggested reading encouraged children to talk about new things. Some 92% of parents felt that reading books where animals were the main characters helped youngsters make sense of human feelings, experiences and relationships. Nine out of 10 parents said reading books about animals increased children's interest in the natural world. Among parents, the Mr Men series came top with 22% saying it was their favourite. The Very Hungry Caterpillar came second with 15% and Raymond Briggs' the Snowman was third with 8%.